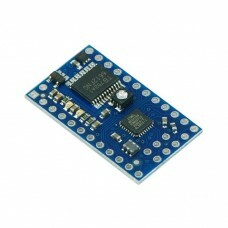 The Baby Orangutan is a complete control solution for small robots, all packed into a tiny 1.2" x 0.7" 24-pin DIP package. Its compact design eliminates bulkier components such as the LCD and switches while retaining the most essential features of the Orangutan robot controller line: a programmable ATmega328P AVR microcontroller and a dual H-bridge for direct control of two DC motors. This integrated motor driver sets the Baby Orangutan B-328 apart from similarly-sized microcontroller boards from other manufacturers. Two on-board indicator LEDs, a trimmer potentiometer, a 20 MHz resonator, and reverse battery protection round out the basic hardware features of the Baby Orangutan. The removal of the larger Orangutan components also allows for a significantly improved manufacturing process that allows Pololu to offer the Baby Orangutan at a very affordable price. Because the Orangutans are based on Atmel’s powerful AVR microcontrollers, the Orangutans deliver significantly higher performance than other similar controller boards. The availability of free development software, such as the Atmel Studio IDE and the WinAVR GCC C/C++ compiler, and low-cost programmers, such as the Pololu USB AVR Programmer v2.1, make the Baby Orangutan B-328 a truly outstanding value. For those not necessarily interested in robotics, the Baby Orangutan is also a great introduction to the AVR microcontrollers because of its size and price. All you need to get started is a low-cost programmer and a power source. 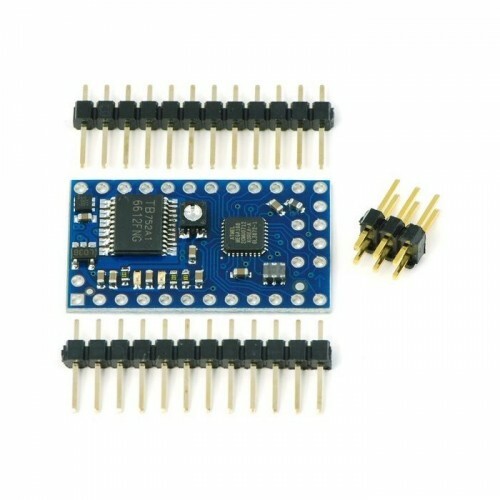 You can fit a substantial design even on a small breadboard since you won’t need the space for basic components such as the voltage regulator and resonator. The source code for several sample projects is available under our resources tab; these examples are intended to help you get up and running quickly with your new AVR-based controller. 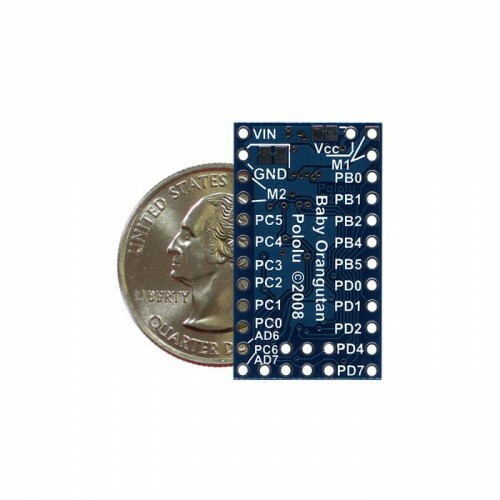 The compact module can be used as a DIP component on breadboards or prototyping boards, or the pin-less versions can be used for space-constrained installations in miniature robots. The 0.1″ header pins are included with the Baby Orangutan but are not soldered in. 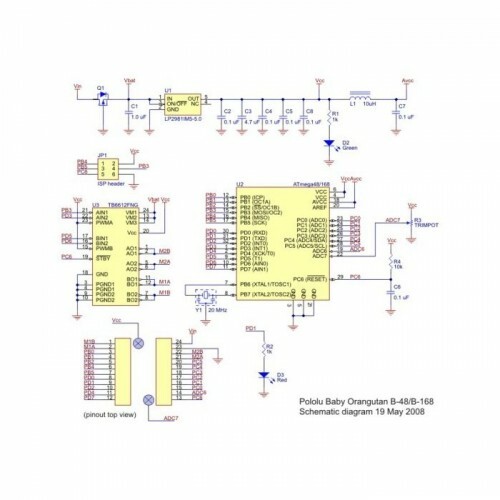 Power pins, one of the motor outputs, and several I/O lines are all accessible from one side to enable use of the Baby Orangutan as a single in-line pin (SIP) package for applications that do not require all of the I/O lines. The small size and low cost of the Baby Orangutan makes it a perfect option for primary control of small robots or for auxiliary control on larger robots. Baby Orangutan B with included 0.1" header pins.